Hard to believe we have had so much rain this time of the year! We have had at least three inches of rain since yesterday morning and Table Rock Lake has gone up almost a foot to 917.3 feet at 2:30 p.m. today. It will go up some more. Chances for more rain tomorrow and a slighter chances Tuesday through Thursday. Temperatures in the upper 80s to low 90s so it will be muggy if it is not raining. Generation every day this past week. Almost every morning it was a low until noon to 1:00 p.m. then lost of water for a few hours. Today was the first no generation and they were not supposed to turn on anything until 5:00 p.m. Guess what! One unit must have come on at 2:00 p.m. and they are running a low one unit right now. San Juan worm. Stan had Mark and his son, Andrew out for half a day. First time for Andrew and he caught some fish on the big ruby midge. Thursday, Jim took Gary and Dianne from Illinois out for the day. Good day for these guys on the weighted Cq streamer, the red midge and the black zebra. Carolyn had Luke and his brother-in-law, Jimmie out for the morning. These Texans caught fish on the CQ streamer and a size 16 hot hare nymph. Both were brand new and both were throwing a line by the end of the day. Allen, from Kansas, spent a long half day on the water with Stan. Not a bad day for them, mainly on the big ruby midge. Darrell had James and Kilton from Arkansas out. They were catching on the copperhead black zebra and ruby midges. Friday, Carolyn had a fun day with Mike and his daughter, Amanda. Not supposed to tell, but I think Amanda was a few fish up on Dad by the end of the trip. Copper dun midge and the hot hare nymph were their patterns for the day. 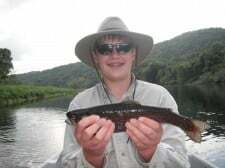 Young man names, Joey, spent all day on the river with Jim learning the fine art of fly fishing. He learned a lot and Jim said he was a fast learner and pretty much putting the line where he wanted by the end of the day. Also did well catching on the weighted CQ streamer or the black zebra with the copperhead. Sunday, Stan took Calvin from Oklahoma out half a day. This was Calvin’s first with a fly rod and he brought several fish to the boat on the CQ streamer, the big ruby and a peach egg pattern. Jim had Jeff and his son, Blake. These two are from Arkansas and enjoyed our river catching mainly on the CQ streamer. Three boats out this morning, but came in a little early when the first clap of thumder was heard……somewhere around 10:45 a.m. Stan’s guys, Chuck and his son, Charlie had enough time to catch a few fish on the size 18 ruby midge. Darrell and Jim had the other group from Indiana, Jill, Brett, Jessica and Brian. All new to fly fishing and they brough a few to the boat, but by the time they were getting the hang of it, the sky opened up. Off the river! This entry was posted on Sunday, August 4th, 2013 at 4:07 pm	and is filed under Fishing Reports. You can follow any responses to this entry through the RSS 2.0 feed. You can leave a response, or trackback from your own site.